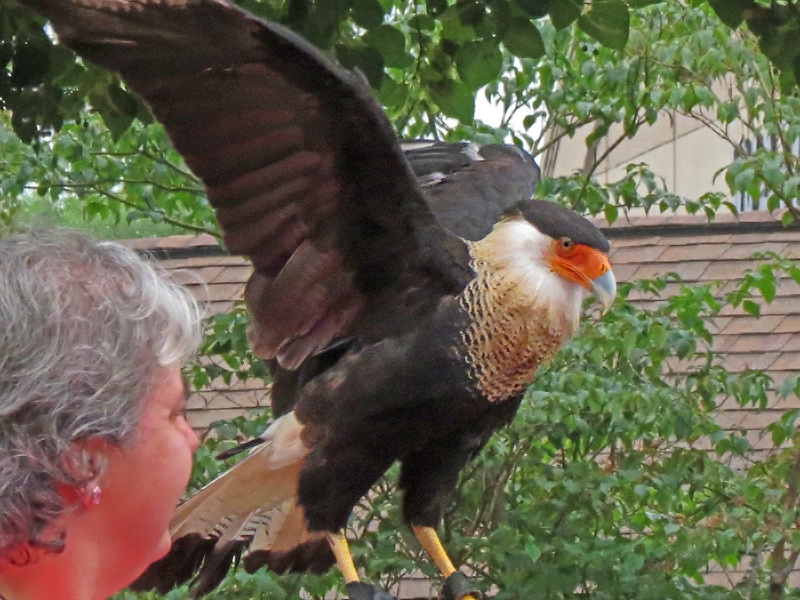 The Northern Crested Caracara was photographed at the Minnesota State Fair with a demonstration by Falconer and Veterinary Technician John Karger. A large, long legged, long necked dark bird often seen feeding with vultures. It has a white chest, black belly, head top, and wings, orange-red face, yellow feet, and whitish dark tipped tail. It has a range of southwestern United States, to Florida, and to South America. It has a habitat of prairies, and range-land. It feeds on carrion, frogs, lizards, snakes, turtles, fish, and small animals. 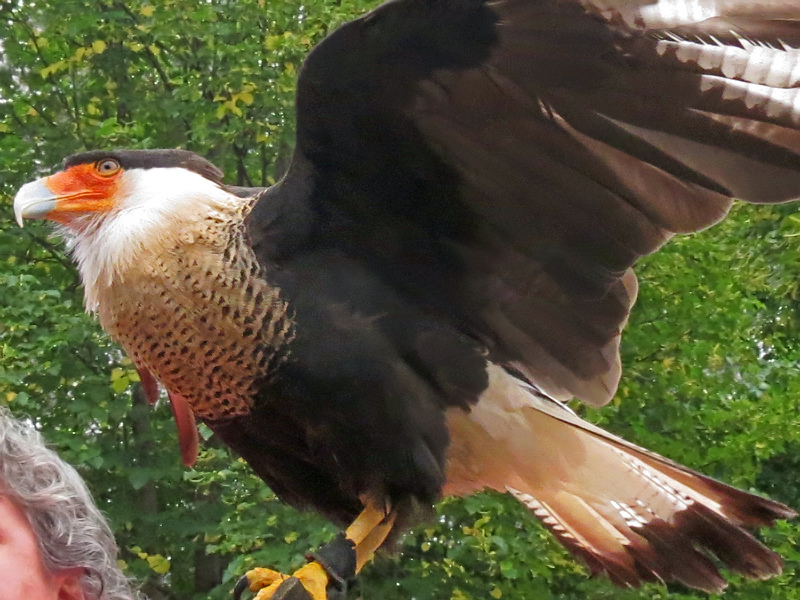 Falconer and veterinary technician John Karger, and founder of “Last Chance Forever” The Bird of Prey Conservancy headed the presentation of the Northern Crested Caracara. The Crested Caracara was most impressive of the rapture presentation, being beautiful, agile, fast, and powerful. Falconer and veterinary technician John Karger, and founder of “Last Chance Forever” The Bird of Prey Conservancy headed the rapture presentation. All birds of prey were from the conservancy and were rehabilitated and were at one time sick, injured or orphaned birds of prey. Two Piping Plovers were photographed at Bradford Beach in Milwaukee, Wisconsin. The Piping Plover is a small pale bird, the color of dry sand, with an incomplete dark ring around the neck, and throat, belly and undersides white, with yellow legs, yellow beak with a black tip. In winter the legs and bill are dark. It has a range of south Canada to northeast and central United States. It has a habitat of sand beaches and tidal flats. It has a diet of insects, marine worms, and crustaceans. 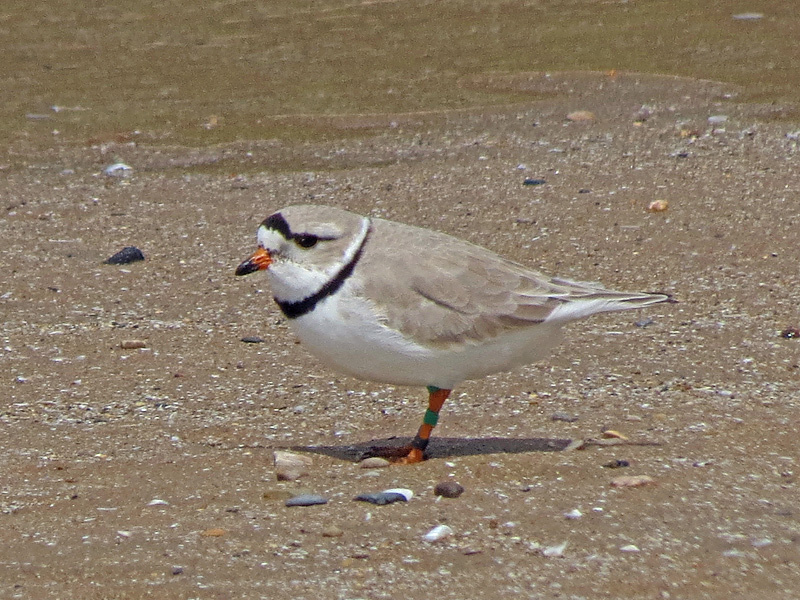 It moves about in quick fashion and abrupt stops, and is hard to see when on the sand when foraging by pecking. 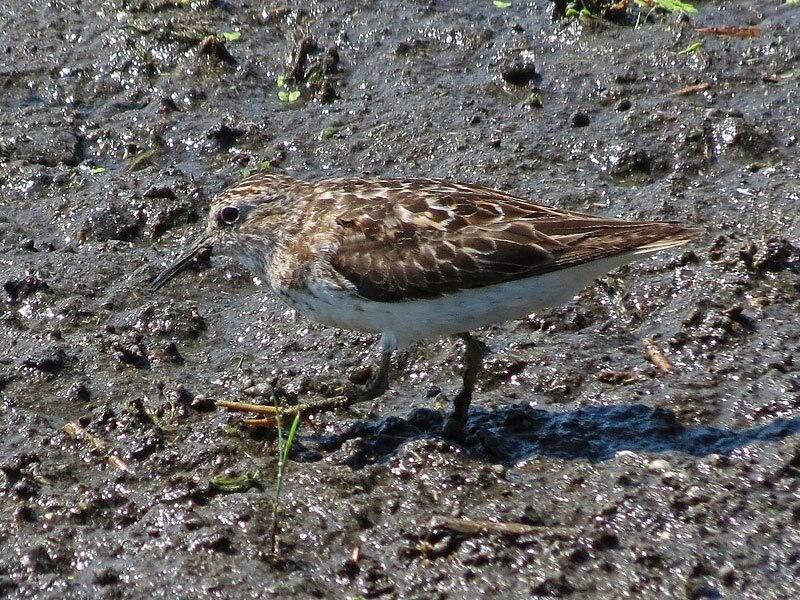 The Least Sandpipers were photographed at Vernon and Horicon Marshes in Wisconsin. 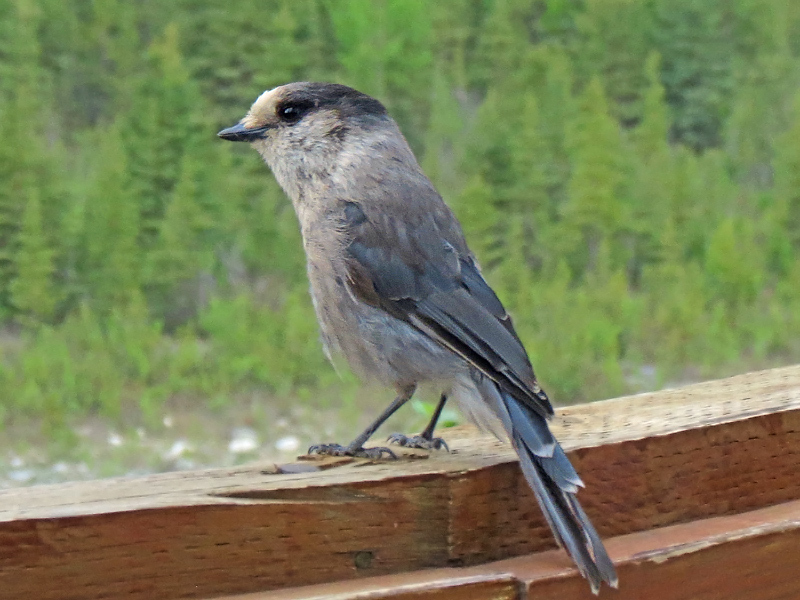 The Gray Jay was photographed at Denali Princess Lodge In Alaska. The Gray Jay is a gray fluffy bird about the size of a Robin with a white forehead, black cap, and gray back and wings, a light striped gray breast, and gray legs. 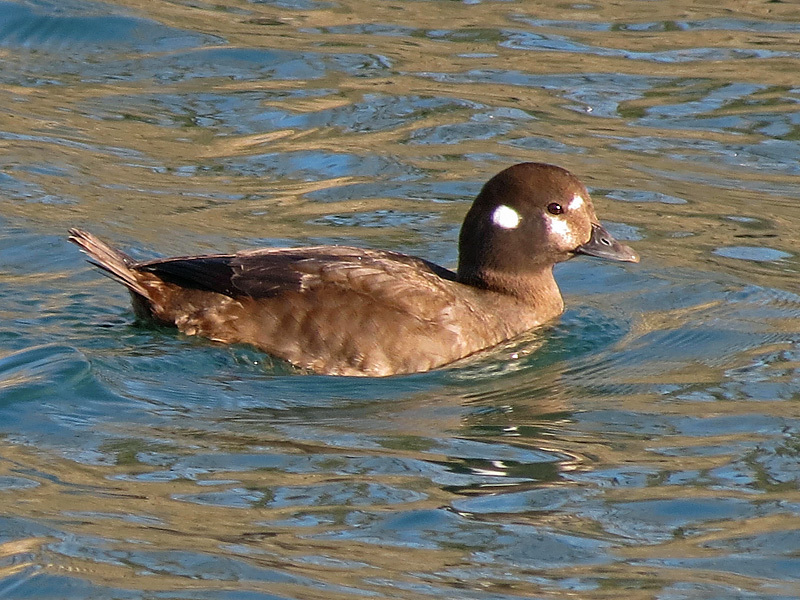 The juvenile is darker sooty gray all over with a whitish chin whisker. They have a range of boreal forests of North American, Canada and Alaska. They have a habitat of spruce and fir forests. It has a varied diet of insects, spiders, berries, seeds, fungi, small rodents, small bird eggs, and carrion. They can be fearless, a nuisance, and steal food at campsites. The Mew Gull was photographed on Nenano River and spruce tree tops at Denali Princess Wilderness Lodge in Alaska, and the bridge crossing on Salvage River East. 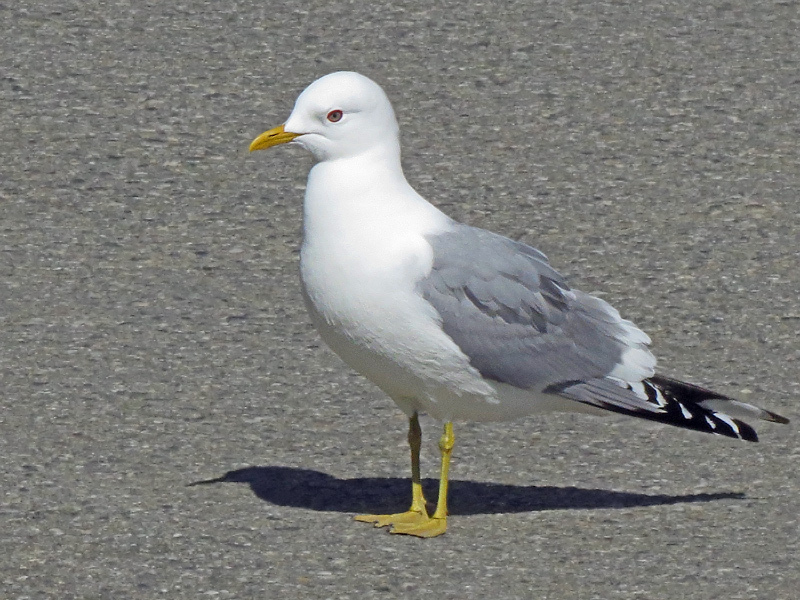 The Mew Gull is smaller than a Ring-Billed Gull with white head, breast and bottom, a gray back, small greenish yellow bill and greenish legs. Its wing tips are black with white spots. It has a range of Northern Eurasia, western North America-that includes the bottom half of Alaska and northwestern Canada. 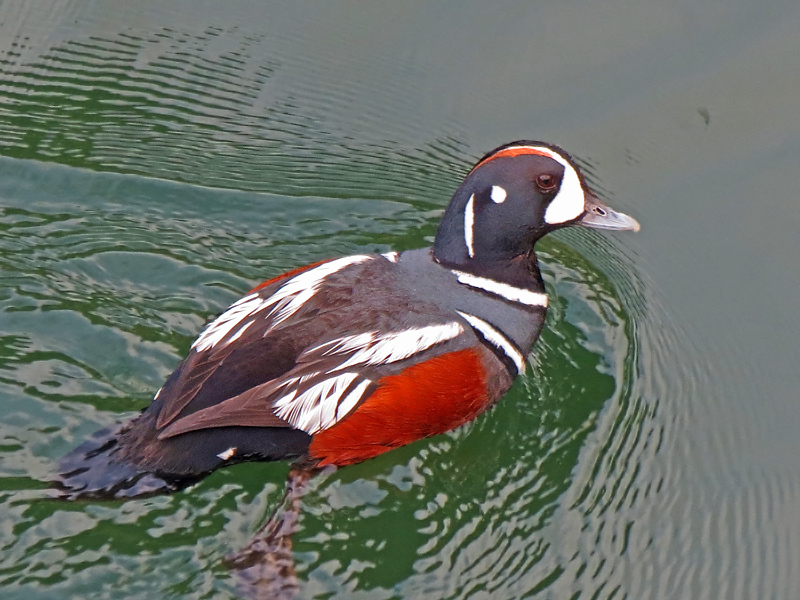 It has a habitat of coastal waters in winter, and lakes and rivers in summer. The diet is mostly small fish along the coasts, mostly insects along inland lakes and rivers, but also eats crustaceans, mollusks, earthworms, small rodents, young birds, berries, and grains. Nest may be on high ground, on top of a stump, or in a dense low spruce up to 20ft above the ground-all near water.